The nearly seven years of conflict in Syria, the forgotten war in Yemen and the continuing conflicts in Iraq are about to destroy the Middle East. In this difficult context, the former “Switzerland of the Middle East” maintains peace as best it can. Maronite Patriarch Boutros Raï recalls the importance of cohabitation between Muslims and Christians in Lebanon, and the effects it has for the entire region. Now, even this coexistence is under threat, due to the war and the pressure it brings with the presence of hundreds of thousands of refugees. al-Qaa (Qaa), a predominantly Christian village in north Lebanon, was violently attacked by a wave of 8 suicide bombings on June 27, 2016. Four suicide bombers struck in the village of Qaa early on Monday morning, causing the fatalities and wounding 15 people. That evening, as friends and family members of the victims gathered outside a church, two men on a motorcycle threw a grenade before blowing themselves up, wounding another 13. Al monitor reported around 4am, four suicide bombers caught the attention of a local who had woke early to eat before fasting. Suspecting foul play, the resident took out a weapon and fired at one of them, who then blows himself up. Other neighbors and Lebanese soldiers ran to the site of the explosion, clashed with the other three suicide bombers, who detonated themselves subsequently at 10-minute intervals. A rescue worker carrying one of the wounded was killed during the second blast. A security official said the evening explosions took place while families of those killed in the earlier bombings were gathering to prepare for funerals. The official spoke on condition of anonymity because he was not authorized to speak to reporters. Lebanon’s official National News Agency said 13 people were wounded in the late night explosions. Fr Elian Nasrallah, a local priest, said the explosions went off near the Saint Elias church and were followed by gunfire. Following the attacks, the army urged people to avoid gatherings and to cooperate with authorities. Villagers were struck fear and panic and barricaded themselves indoors. No organization has claimed the responsibility for the 8 attacks, but, experts believe it was ISIS fighters who crossed over from nearby Syria.. Lebanon is a hosts huge numbers of refugees fleeing the Syrian war. It is claimed that ISIS fighters have sent their families to refugee camps in Lebanon. Their jihad subsidized by the disorganization of the international community. The attacks raised tensions in Lebanon. Last week after meeting with Prime Minister Tamim Salaam, Lebanese security officials released a statement warning the al-Qaa attacks could be the “harbinger of a wave of terrorist operations.” Lebanese security forces stepped up efforts in arresting alleged IS sleeper cells in the north. The Catholic Herald reported Foreign Minister Gebran Bassil, while visiting Qaa, said the village formed part of a “fence” for Lebanon. “When a terrorist enters, he can go anywhere,” he said. Bassil, heads the Free Patriotic Movement party, the largest Christian bloc in parliament. He sparked condemnation for calling on municipalities under his party’s control to ban any gathering or camps of Syrian refugees. Please pray for peace and the people of Lebanon. 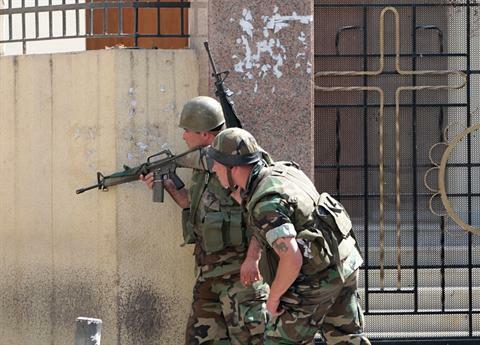 Pray also for the strength in faith and endurance of our Lebanese Christian brothers and sisters. 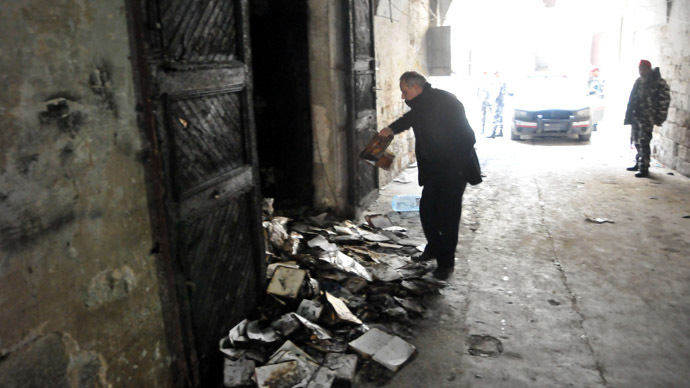 A demonstration had been planned in Tripoli after the pamphlet was found but was reportedly called off after the library’s Greek Orthodox owner spoke with Muslim leaders. Lebanese news outlet Naharnet also reported that one of the library workers was shot and wounded Thursday night. The library owner, Father Ebrahim Surouj, met with Islamic leaders in Tripoli. It became clear the priest had nothing to do with the pamphlet, and a demonstration that had been planned in protest over the incident was called off,” the source said. TRIPOLI, Lebanon: Residents of the Tripoli neighborhood of Zahrieh were still reeling from attacks targeting businesses owned by Christians and Alawites over the weekend, with some fearing the incidents were meant to fuel sectarian hostilities. The attacks took place overnight by unidentified armed men, as owners were surprised to learn early Friday when they arrived at the main street of Zahrieh to open up their shops. They rummaged through the debris, as many shops had been burned, to see if any of their merchandise could be salvaged. All of the owners belong to the Christian and Alawite communities of Zahrieh, causing some observers to muse that they were paying the price for long-standing sectarian tensions in the northern city. The affected shop owners, identified as Fadi Khoury, Jean Maamari, George Rachkidi, Farid Estephan, Tamim al-Atrash and the owners of retail chains Eskandar and the Nidal boutique, expressed frustration over the incidents, saying they were shocked and saddened that their properties had been damaged and fearful that there were certain parties in Tripoli seeking to remove them from the city. Belonging to a minority group in Tripoli, some shop owners said they didn’t have authority figures to complain to either. “There is no one here to protect us, because we live in Tripoli,” Maamari said dejected. Residents have long complained that the area is underdeveloped and constantly overlooked by the government, centered in Beirut.